Expiration tags on clothing certainly would eliminate a lot of confusion. If a woman simply knew when her clothes should be purged, she wouldn't have those nagging doubts about whether a certain item is still 'in style'. Unfortunately, there aren't any clear-cut rules to follow. Some of what you own could remain in there for years, while other items might only stay in your closet for a season or two. But don’t worry...you’ve got MissusSmartyPants to help you sort through the closet clutter! The truth is: 80% of what’s in your closet is not being worn! That means there are a lot of clothes taking up valuable real estate if only 20% are being worn on a regular basis. Do you really want to sort through all that clutter just to find something to wear each day? The importance of closet organization. Women often underestimate the importance of closet organization and therefore never get around to putting their closet in order.
. An organized closet saves you time! You probably waste a lot of time looking for something to wear. Since you must get dressed every morning...why wouldn’t you want to spend this precious time doing something else???
. An organized closet saves you money! Women often buy similar items over and over again because they don't know what's in their closets! Stop the duplicate purchases by finally creating a wardrobe plan (now that you know what's in your closet).
. An organized closet helps you improve your style. Something magical happens when you remove the clutter...you start creating stylish looks with LESS clothes! 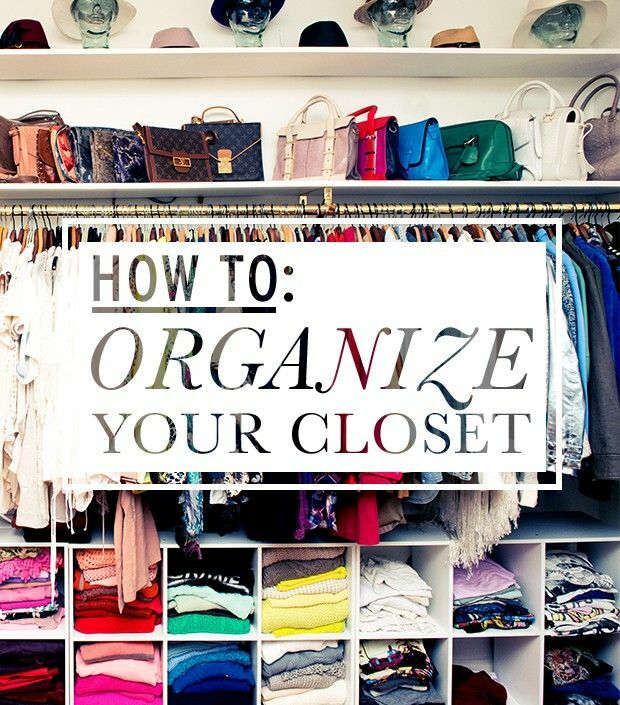 If your closet has been neglected for awhile, it will take some time to organize it. However, this decluttering process could be broken down into baby steps by doing one section at a time (in phases). Don't be discouraged because the rewards of having an organized closet are going to pay-off big time! Soon, you'll be doing a 'happy dance' because a cleaned out closet re-energizes you! 1. Right Size It. If it is too big or too small (Seriously, are you waiting to be that size again?) Dress for TODAY! If it doesn't fit, purge it! 2. Not Fitting In. It fits poorly. Maybe you could wear it if it didn't pucker or if it was let out a little. Either take it to a tailor, or purge it! 4. Are Hue Sick? It's a bad color for you. Every time you put it on you get asked if you feel alright. Truth is you don't look good in it and it just sits in your closet...you know what to do with it. Purge it! 5. A Mutual Dislike. You never liked it and it never looked good on you! Go ahead and purge it because it's taking up precious closet space. Allow someone else the chance to love it - give it to charity. Now it's time to put everything you still love back into your closet in an organized fashion. This is the start of your closet transformation! Ready...set...go! __Stay in season. Pull out everything and put into piles by season. (If removing everything from your closet sounds too overwhelming, follow this process by doing only ONE section at a time. For example, do only skirts one day). Depending upon your closet space decide where you want to store out-of-season clothes. The object is to get clothes from winter out of your way when it's May...it makes no sense to scan through out-of-season clothes on a daily basis. __Birds of a feather. Organize by item. All blazers need to be on the rack together. All long sleeve blouses together, as well as short ones with all the short-sleeved blouses and shirts. Do the same with your pants, dress pants together, jeans together...like items with like items all together on the rack. Fold all short sleeve t-shirts in a pile (or in a drawer) long sleeves together. You get the picture. Use baskets (or drawers) for undies and pajamas...work a system just for you! Remember: birds of a feather flock together. See how easy this is? __Paint by numbers. Now colorize each grouping of clothing. Put all blacks together of each item, all browns, creams and so on. This will help you see what colors you have in your closet. Is there too much black? Great if you are a funeral director! You should consider looking into other colors that are flattering on you. Do you see a color pattern now that you have colorized all your clothing groups? __Be your own stylist. Now it's time to get creative and have fun with what's left in your closet. Put together outfits with the existing clothes in your closet. Try some things together that you might not have thought before. You'll be surprised how many stylish outfits you can create is you aren't missing too many key wardrobe pieces. Pull out your accessories, scarves, belts, earrings, or a keepsake necklace that will make a unique look - your special look. __List it. Make a list. More than likely there will be some gaps in your wardrobe that need to be filled. Maybe you could put together a really great outfit, but you lack a pair of cream pants to pull it off. Write what you need on a list and tuck it into your handbag for when you shop. This list will become part of your basic wardrobe plan. Click link below to see photos of a cluttered closet transformed into an organized one!